with public money appropriated by Congress. Yeah, well, AOC is stark raving mad! I take it AOC considers the original New Deal by FDR was a success, so she is just upping the stakes. I don’t know what the mystery is. You just pay for it! “People often say, like, how are you going to pay for it and I find the question so puzzling because ‘How do you pay for something that’s more affordable? How do you pay for cheaper rent?’ You just pay for it,” she said. She can always buy one of these on the internet to just pay for it. There might even be enough over for her to pay her not entirely cheaper rent. Clearly people don’t get it. When the government runs out of other people’s money, it simply prints new money. What’s not to understand? Noah Smith at Bloomber discussed her plan the other day – see here. It is impossible to know how much it would cost. Smith suggests $400 billion per year for renewable energy generation. The Universal Basic Income and Green Renovations of every building in the USA would be in the trillions most likely. They believe in interest free money issued by congress. They do not understand that interest is human phenomena. Why would the average American care about or understand the levels of government expenditure after so many years of being desensitised with excessive use of the terms Billions/Trillions. with the public‘s money misappropriated by Congress. Looks more like I broke it! That opening quote mark ‘ should of course be an apostrophe ’. Appropriated is the operative word here. They’ll steal it from present and future generations of Americans who’ll have to suffer a decline in the value of their savings, higher prices and falling economic growth. Are you suggesting that Socialism will fail? But AOC and her supporters will do Socialism properly, it can’t fail. The State cannot run out of fiat currency. The proles can run out of the willingness to accept it has any store of value, but as long as the State has paramilitary death squads, the fiat currency can be insisted upon as their chosen medium of exchange. As in, you get to exchange your support of their fiat currency for the right to spend one more day out of the gulag. We do that now. What’s new? Each US state should have its own floating currency, as should each Australian state. A Tasmanian Tiger note would be worth about 10% of a Queensland Toad Note, a South Australian Crow would be worth 5% of a NSW Waratah and so on. As each commie trashes his state with redistribution and other socialist acts, their economy would tank without much affecting other states. Best way to wake people up. Give them their own local currencies. Socialism would end in a hurry (well, maybe). p.s. Would it not be a worthwhile exercise for an economic boffin to write up a paper detailing what each state’s currency would be worth were they to issue their own currencies? The level of questioning by the media at the time highlights the inadequacy of the media in general having enough wit to ask the next level question. We all might be better informed if they did. Venezuela hasn’t run out of currency. It has run out of toilet paper. Unfortunately if you use the latter for the former your loo clogs up. Oops, other way ’round. 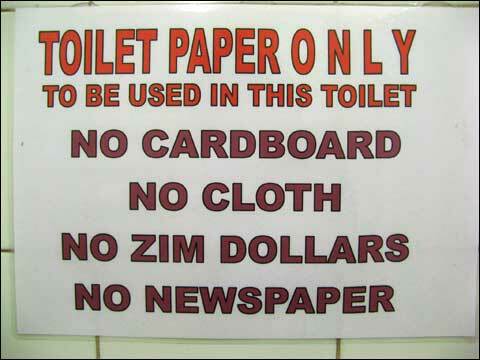 Bogging your bog with trillion bolivar notes would be a bummer. She has taken campus politics to the big house. I’m sure in her bubble it all makes sense and the media are doing their utmost to protect her from the truth or criticism. I think she will only get more radical, especially with her guilt by imagination stuff and her racism. She seems to have forgotten to put these words on the end of her answer: ” from all Taxpayers particularly well off taxpayers”. It’s a miracle. A miracle, I tells ya.! Sadly its the same magic pudding discovered by left leaning halfwits everywhere (and if it comes to that, everywhen). Truly AOC is too dumb, too lacking in intellectual curiosity to understand that wealth has to be created. And if people are punished for creating wealth then they stop creating it and the Ponzi Scheme falls in a hole. Like other dumb people who have managed to get their arses on ato a seat of power she truly is the gift that keeps on giving. AOC has toddler-level understanding of economics. She has a similar level of understanding of other areas of public policy. A perfect fit for the Democrats, and even more so the Australian Greens! She is correct, the parliament voted that the government can appropriate your money and possessions, the only variable is how much. AOC is merely advocating all of it. Maybe they could start using cryptocurrency, that looks like it’s doing well.